Here, at my desk, standing on a treadmill, I am completely at home. I could start the treadmill and walk slowly—movement helps when I am writing poetry—but more often, I only stand and prop my elbows on the desk surface. In every work space I’ve had, I face a window. 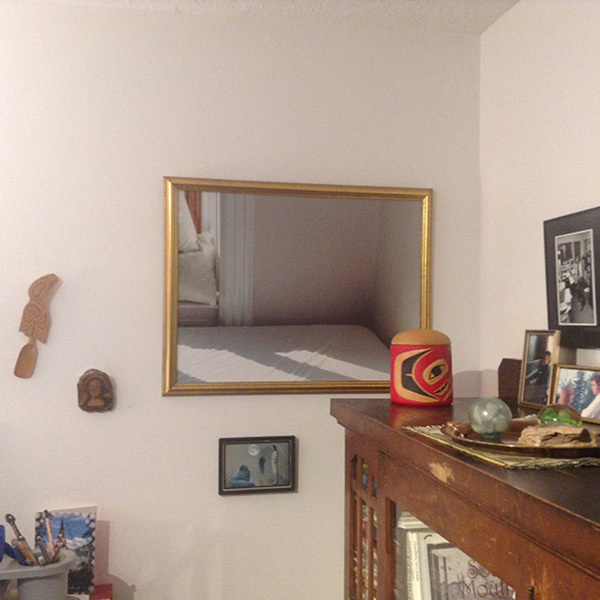 You cannot see the window in this picture, but it looks out on a small garden. 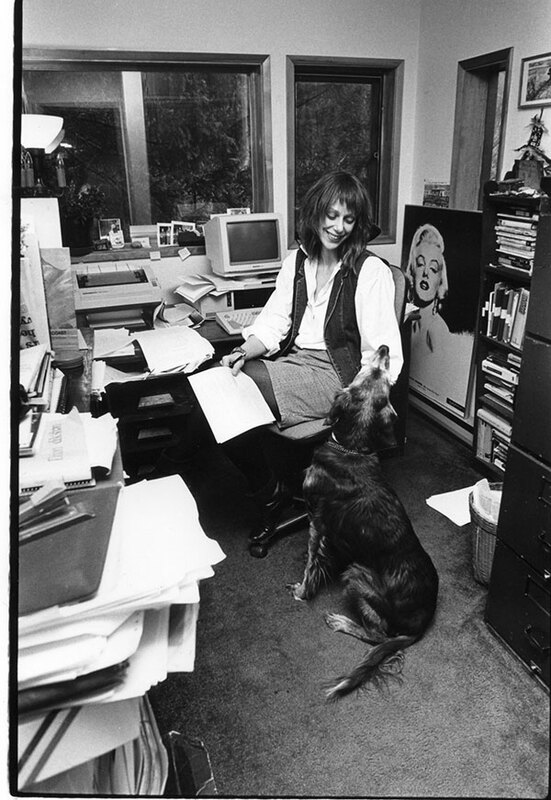 In the photograph of my workspace of thirty years ago, a blur on the wall behind me, you would find its window opens directly onto a forest. A few of the objects visible in that photograph are here too: a cartoon watercolour of a bear with its arms raised to the sunrise over the Sooke basin, which I painted in the middle of a night when I was filled with such joy I could not sleep; a collage of a woman crossing the ice—a figure in one of my early poems—by Robin Skelton: the story within it is of my grandparents’ first meeting at a fish-camp at Holton, Labrador. Out of sight behind my computer screen is the lamp you see in the rear left corner of the old photograph. 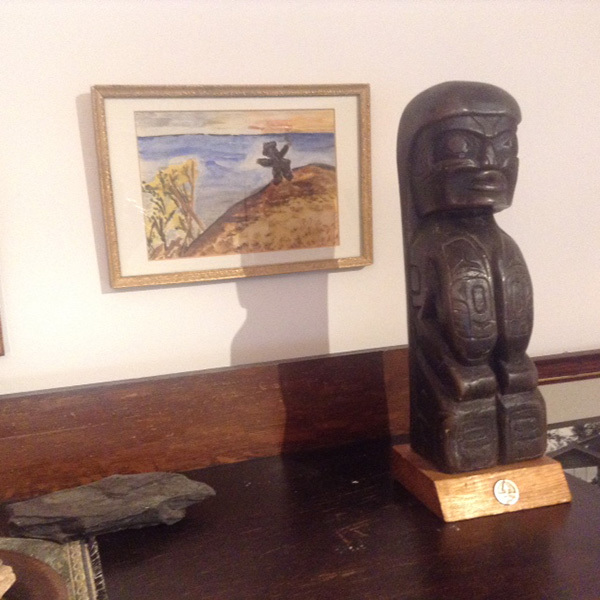 Much has changed, too, books and artworks and objects gathered in travel and from friends make an assemblage of support and connection—any writer will tell you she needs help to do what she does. Near the poster of Marilyn Monroe in the older photograph, are files and books I consulted, and the recordings of her voice I listened to as I wrote a book of poems about her. Today, as I fill in this year’s calendar, I add the Spring dates of the UK premiere, a fifth production, of an opera by Gavin Bryars derived from that work (I wrote the libretto.). 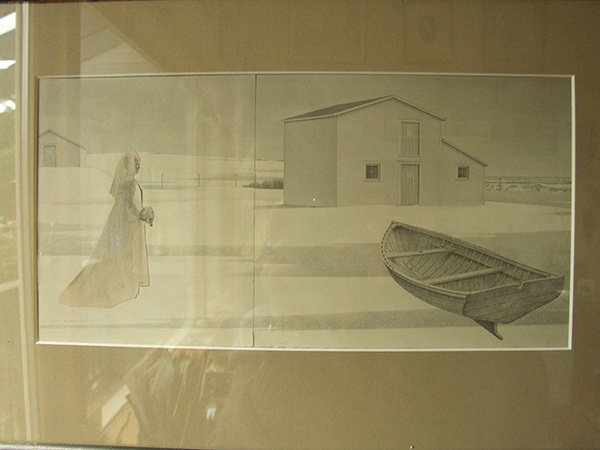 A collage by Robin Skelton of a woman in a wedding dress crossing the ice. Not everything survives (or even very much), but what does suggests a continuity to a journey which has often felt navigated blind. I am learning a little about real navigation, too: my beginner textbooks are propped against a small filing cabinet to the ‘sunrise’ side of the book cabinet behind me. The poems TNQ is publishing were written at the desk I lean on, and because I now live close to where I spent my childhood. Places and experiences return to mind, but are interestingly altered by changes to the lens through which I see. These poems surprise me with their shifts in perspective, and the information they convey about what I carry with me, what I did not know I knew! I have a good memory, but it is not eidetic as was my brother’s. It is of no use in an exam, but it holds within a visual image its atmosphere, scent, colour and (often) areas that I can examine closely, as if I held a magnifying class over them. So far, it has proven its accuracy. I seem to have ignored this ability throughout much of my life. I write fiction and non-fiction seated at a second desk directly below the window: when I move there, I enter a world of research and drafts which would be overwhelming if I didn’t know in which pile or file everything was; or if I didn’t have a few icons, drawings and objects near there, too, which have, one way or another, to do with courage. I am thinking especially of a glass spider in its web which brings my late friend Liz Gorrie, a writer and director of magical theatre, to mind. One of the kindest and most creative women I have known, I miss her and her optimism. Every image in this room is a teacher: Mercedes’ painting, in blue and white, of the spiral of the dreamer’s dream, my mother’s speed skates, a photograph of the church brass band in which I played. Not long ago, I found, in a Women In Need shop next to Save-On Foods, a version, painted on stone, of Pietro Perugino’s “The Virgin’. (He was an Italian Renaissance Painter of the Umbrian school). It was painted by the Polish artist and composer, Roman Orlov in 1970, and altered just enough to show that Orlov understood this face well. Did he see someone he knew in her golden peaceful containment? Just now, I imagine my daughter’s face reflected there: this is fitting since the icon hangs next to one of her photographic works. The icon is on the wall behind my right shoulder. Study Corner 2. A snap that shows my joyous bear watercolour cartoon. And D’Sonoqua. I don’t have room to do more than mention several books. Patrick Friesen’s Songen is one of the best poetry books I have read in years. It takes time and re-reading, and it is wise and human and often very funny as well as playful with its take on archaic language. I have given Anne Michael’s Infinite Gradations to several friends. It is also wise and human and, like Patrick’s book (although very different in style), it is not afraid to add wide-ranging culture to its ecology.